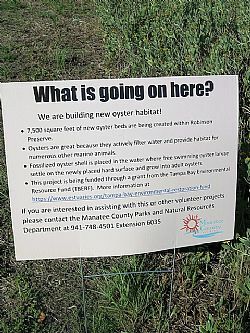 SARASOTA – The Sarasota Bay Estuary Program (SBEP) Bay Guardians will visit Robinson Preserve Saturday, December 12 to complete a morning oyster bagging project. The plan is to fill large mesh bags with fossilized shells to create a stable habitat that attracts juvenile oysters. Oyster beds provide structural habitat for many species of fish and invertebrates. Oysters are valued for their ability to improve water quality through their prolific filtering capacity. The oyster bagging project is a joint effort with the Tampa Bay Estuary Program (TBEP)’s “Give a Day for the Bay” Volunteer Program. Project partners include SBEP, TBEP, Around the Bend Nature Tours, and the Manatee County Parks and Natural Resources Department. The Bay Guardians Program is managed by SBEP in partnership with Around the Bend Nature Tours. The adult and student volunteers have donated many thousands of hours supporting restoration projects along the bay and in area parks and preserves. The Bay Guardians complete at least six projects in Sarasota and Manatee County each year. Each outing includes environmental education and a picnic lunch following the morning project. To sign up for notices about Bay Guardian volunteer events, please visit the SBEP website’s Bay Guardian page listed under the Get Involved section. To register for the Dec. 12th event, please use the link below. Registration is required and space is limited.